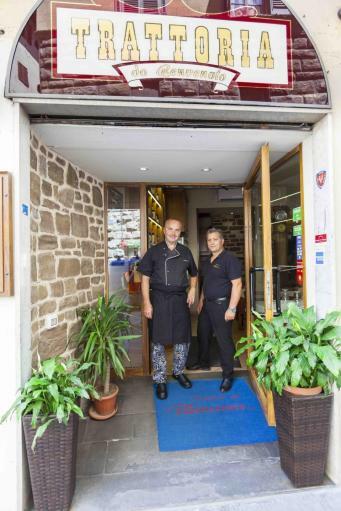 In the historic center of Florence , a few steps from Piazza della Signoria, Giuseppe , Leonardo and Silvano manage La Trattoria Benvenuto, one of the oldest trattorias in Florence that since 1943 is a reference point for all those who love good Tuscan cuisine. The years have passed but attention to the dishes and the search for the Florentine culinary tradition remains and distinguishes the restaurant. Every day at Trattoria Benvenuto you can enjoy the succulent dishes of the all Tuscan menu with many Florentine specialties. The menu is varied and offers different dishes every day, including fish. You can choose from the classic Tuscan antipasto, to crostini with lard, smoked swordfish carpaccio, fresh pasta dishes, truffles, the classic Florentine steak (to try), ossobuco, mixed boiled meat. To finish the delicious homemade desserts, all accompanied by a good list of red and white wines. At the welcome restaurant you can stop for a quick lunch break, accept the major meal vouchers, a business lunch, or a simple dinner with friends. In our three rooms, all air-conditioned, we can also host dinners for birthday parties, graduation parties or simple groups of friends on holiday in Florence (30/35 people per room).